Optical Surfaces Ltd. have provided the Space Science department at the Rutherford Appleton Laboratory (RAL), Didcot, England, with three identical 110mm diameter Off-axis Paraboloids for use in three generations of their Along Track Scanning Radiometers (ATSR). 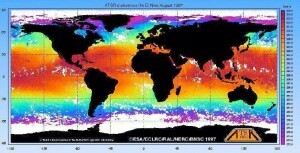 Concerned with long term global climate monitoring and modelling, the RAL group are using ATSR remote sensing technology on board European Space Agency (ESA) satellites to study effects such as Global Warming, `El Nino` and their link with atmospheric pollution. As part of an advanced space instrument, RAL required a focussing optic from Optical Surfaces with a design which combined low weight with high performance. Drawing upon 30 years of design and manufacturing experience & benefiting from a stabilised manufacturing environment, Optical Surfaces supplied three identical 110 mm diameter Zerodur Off-axis Paraboloids with a surface accuracy of better than lambda/10 p-v and surface smoothness of better than 10 Å. With a hard gold coating the Off-axis Paraboloids minimised loss of signal to less than 1 % in the key spectral measurement regions. The ATSR satellite instrument uses the Off-axis Paraboloid to focus radiation from the Earth’s surface through a field stop beyond which beamsplitters split the radiation onto an array of mechanically cooled Indium Antimonide and Mercury Cadmium Telluride detectors operating at narrow bands in the Infrared region and uncooled silicon detectors in the visible region. The ATSR is today the world’s most accurate remote measuring radiometer. It produces images of the Earth at a spatial resolution of one kilometre and can provide surface temperature measurement to within +/- 0.3 Kelvin. This performance may be attributed to a series of design features. The ATSR incorporates high precision, low loss optics mounted in rigid carbon fibre to ensure minimal signal loss or drift. Precision is maintained by two on board blackbody calibration sources to ensure thermal stability of +/- 0.1 Kelvin for each scan. The ATSR package uses a unique dual raster scanning mechanism where it simultaneously scans a 500km track both straight down and at 45 degrees ahead. With the availability of two sets of measurement data over different pathlengths the ATSR is able to factor out contributions from atmospheric absorption and emission which have limited other systems. The first instrument (ATSR-1) was launched on board the European Space Agency (ESA) European Remote Sensing (ERS) satellite in July 1991, as part of their Earth observation programme. An enhanced version of ATSR (ATSR-2), using the second of the Optical Surfaces Off-axis-Paraboloids, was launched on board ESA`s ERS-2 spacecraft in April 1995. ATSR-2 was launched to continue the work of ATSR-1 which benefited from direct data correlation resulting from the identical optics. Through its new IR-Visible detection capabilities the ATSR-2 satellite instrument has been used also to map changes in the Earth’s vegetation state (an accurate indication of global climate changes in land masses). The next stage of the ATSR programme, the AATSR (advanced ATSR), was successfully launched on board the Envisat space craft in early 2002 to continue the long-term study of global climate change. Including advances in electronics and mechanical design the AATSR will again benefit from the high precision, low loss performance from Optical Surfaces Off-axis Paraboloids. Optical Surfaces are proud to have contibuted the primary optics to these three generations of space instruments.